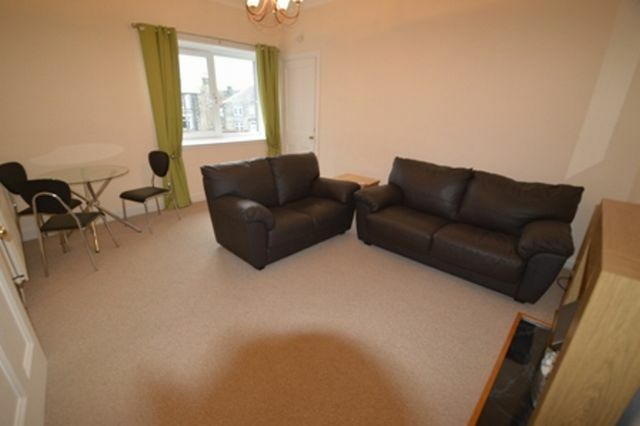 Beautifully presented and very generous one bedroom upper flat in West Calder. Property is located just up from the train station and a few minutes walk from the High Street. This property has its own front door and you enter directly into the kitchen. There is a well presented kitchen with good work space and storage, kitted out with all white goods. Furthermore the property has a large living room/dining room with feature fire place. The decor is neutral with NEW carpets. There is a large window creating a BRIGHT room with NATURAL LIGHT. The bedroom is equally generous with large IKEA style mirrored wardrobes running the length of the back wall with a nice dressing table area. Again, neutral decor Separate to this is a small study room, fitted with shelves and computer/desk area; benefitting from a window to the front. The bathroom has a 3 piece white suite, with shower over bath. GCH and double glazing throughout. The property is located very centrally in West Calder and within I minutes of the station which has frequent services to both Glasgow and Edinburgh. EPC RATING: D. Awaiting Landlord Registration.